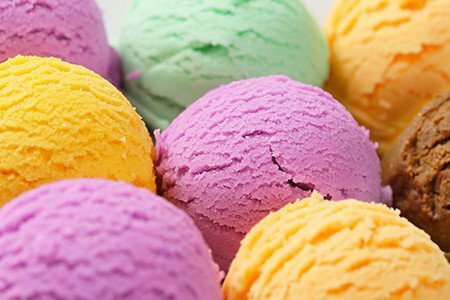 Do You Know the Different Styles of Ice Cream? Everyone loves ice cream. It’s fun and delicious no matter what time of year it is. Did you know that there are many different types though? You can find anything from sorbet, to custard, to New England style, even to Mochi Ice Cream. Discerning the different types of ice cream can be incredibly fun, as you get to learn about where each different type came from, and their respective histories. Want to know how to discern them? Here are a few different types of ice cream and their respective characteristics so that you can find the one that you love most. Commonly used as a palate cleanser in fancier meals, sorbet is one of the types of ice cream with the iciest consistency. Commonly created with fruity flavors in mind, sorbet is completely dairy-free, relying on the fruit alone to create the flavor for the dish. As you freeze sorbet, tiny crystal networks form, creating the strange consistency that you really can’t find in any other type of dish. Some dairy chefs have resorted to creating types of sorbet that have dairy involved, but if you’re a sorbet purist, you know that dairy is never involved, leading many people to believe that it’s not really a form of ice cream at all. This is the most rich type of ice cream, as it’s made with mostly heavy cream and eggs for a mix of flavor and texture control that you can’t find in any other type of ice cream. This type of ice cream is at least ten percent butter fat by volume, making it a hearty, yet unhealthy choice for many people that want to indulge in a tasty treat. You’ll often find this type of ice cream across America, especially in the midwestern parts. If you’re thinking of ice cream, the type that you’re probably thinking of is a classic New England scoop. New England ice cream is incredibly chewy: it’s the kind of ice cream that you almost bite off of the cone. Incredibly dense and flavorful, one of the very best styles of ice cream that you can enjoy is New England style. Because it’s so dense, this type of ice cream is the perfect candidate for toppings, as it’s very easy to make sure that the toppings stick effectively to the rest of the cone. The fun thing about ice cream is that no matter where you go, there’s a new type for you to sample. Do you know the differences? Next time you’re out and about, are you going to go for some sweet and fruity sorbet, hard and flavorful custard, or a chewy New England style that’s perfect for all of those delicious toppings that you want to add on? Now that you know the proper differences between these three types of ice cream, you’re going to be able to discern which type of scoop that you’re getting on your next trip to the ice cream shop.